It’s been a wonderful experience to ponder on the theme of this year’s conference and the theme for this session: “REPLENISHING AND FORTIFYING OUR SPIRITUAL RESERVES.” I’ve thought so much about having a SPIRITUAL RESERVE. I’ve wondered what that means. I have come to feel that it’s having “enough and to spare” of SPIRITUALITY. And WHAT IS SPIRITUALITY? “Her name is Mary Ellen Edmunds, and I hear she’s really SPIRITUAL….” Well… that got me thinking…. What did she mean? That I attend meetings regularly? I do. Keep all Ten Commandments? I hope so! Pay my Tithing? Yes. Did I have a GLOW about me? No. I think SPIRITUALITY is a whole lot more than what someone may have thought. Simply stated, I think SPIRITUALITY is the DESIRE (and the increasing ABILITY) to SEEK, RECOGNIZE, and RESPOND to the SPIRIT – It’s doing what we need to do to have the SPIRIT – the GIFT of the HOLY GHOST – with us ALWAYS. Spirituality leads to Godliness, to holiness, to personal goodness, to a mighty change of heart – to a sweeter relationship with our Heavenly Father and our Savior (as well as with each other). I love the way Alma speaks of SPIRITUAL REBIRTH as an AWAKENING. He tells us that with some, God “awakened” them, and that they “awoke unto God.” This awareness of God, and a sensitivity to what is sacred with the help of the Holy Ghost, is the essence of spirituality. The guidance of the Holy Spirit, the Holy Ghost, can sometimes lead us to life-saving actions – for ourselves as well as others – both temporally and spiritually. A friend who avoids going to doctors had a strong prompting a few years ago to do just that; she’d been experiencing unusually strong dizzy spells. It was discovered that she had a life-threatening cerebral aneurysm. If she hadn’t responded to the prompting and received treatment – surgery – she may not be with us today. Years ago a Primary chorister followed a strong prompting to visit a little girl who had stopped coming to Primary, mostly because she was the only one in her family who was participating in the Church in any way. The chorister told her she missed her. She said “We don’t have anyone to sing the high notes.” The little girl came back, and she never left again. Her life was changed for the good – and she eventually sang the high notes as a member of the Mormon Tabernacle Choir! SPIRITUAL GROWTH comes from SPIRITUAL SOURCES. Each time we respond to the Spirit – to PROMPTINGS from the HOLY GHOST – we increase our spirituality. We REPLENISH our SPIRITUAL RESERVE. If we think of spirituality as a TALENT … it likely means we can IMPROVE our ability to recognize and respond to the Spirit (rather than DEMONSTRATING how spiritual we are in a TALENT SHOW). Nothing comes before Him – there are NO priorities ahead of God. This can be a very helpful KEY to keep in mind as we strive to PRIORITIZE the many responsibilities we have in our busy lives. Our personal SPIRITUAL RESERVE is compared to OIL in the SCRIPTURES. We’re familiar with the PARABLE about the 10 VIRGINS – FIVE had a “RESERVE” of OIL for their LAMPS, and FIVE did not. SO WHAT IS THE OIL? WHAT DOES IT REPRESENT? The OIL is the SPIRIT – it is the HOLY GHOST. It represents the depth and strength of our TESTIMONY of JESUS CHRIST – the “condition” of our SPIRITUAL RESERVE. The five WISE VIRGINS had prepared themselves carefully for the coming of the BRIDEGROOM (JESUS CHRIST). They had filled their lamps with OIL to provide LIGHT (and maybe also some HEAT) – they had fortified their SPIRITUAL RESERVE with good works, love, obedience, with being true and faithful. In this parable, the Lord uses OIL to represent SPIRITUAL PREPARATION, something which CANNOT BE BORROWED AT THE LAST MINUTE. It’s HAPPIFYING to me to be with all of you and to know that you are wise women – you’re here because you have a desire to be TRUE and FAITHFUL. You have OIL… you have a SPIRITUAL RESERVE, and you “LET YOUR LIGHT SO SHINE!” THANK YOU! We seek THE BEST GIFTS OF THE SPIRIT and use them in kindness and service to others. 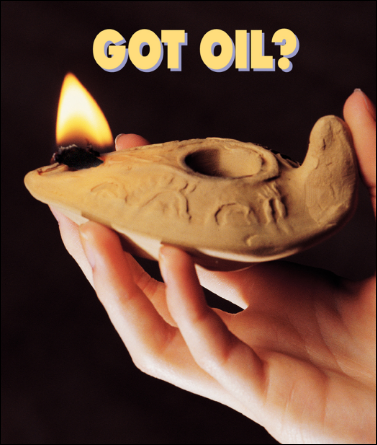 HOW DO WE KEEP OIL IN OUR LAMPS – HOW CAN WE REPLENISH OUR SPIRITUAL RESERVES? By keeping the commandments of God. By living our religion with all our hearts. WILFORD WOODRUFF: When we are laboring for the kingdom of God, we will have oil in our lamps, our light will shine and we will feel the testimony of the spirit of God. (See Wilford Woodruff, The Discourses of Wilford Woodruff, edited by G. Homer Durham, p.124) (JD 22:208, January 9, 1881). 1- THINK DEEPLY – PONDER and MEDITATE more. These are significant, wonderful ways to increase spirituality. Find a time and a place where you can do this, even for short periods of time. Maybe it will be while you’re driving, or walking, folding laundry, rocking a baby, taking time for a longer-than-usual moments in just letting your mind be QUIET as you welcome promptings from the Holy Ghost. These can be REFINING experiences. Often, meditating becomes a time when we can do more LISTENING, when we can give our Heavenly Father a chance to communicate with us through His Spirit. My personal times of meditation and pondering have brought me sweet spiritual experiences. 2- PRAY EARNESTLY – Do what you need to do to make your communication with your Heavenly Father matter more and be more enjoyable. Communicate honestly and often. There is a huge difference between “saying your prayers” and “communicating with your Heavenly Father” – COUNSELING with Him. (Which means we give Him a turn! – We allow Him to tell US what’s on HIS mind, not just the other way around). The most meaningful experiences with prayer happen when we allow the Spirit to help us know what to pray about. Prayer is the opportunity to turn to the spiritual things in life, and to discover a sweeter, deeper relationship with our Heavenly Father, the Savior, and the Holy Ghost. 3- SEARCH THE SCRIPTURES – Put these meaningful, wonderful thoughts and reminders into your heart OFTEN, and you will have OIL for your lamps – you will have the LIGHT you need in your life. Studying the scriptures increases our spirituality, and with that increased spirituality we can see our way more clearly to gain the inspiration from the Lord for our challenges and problems. THE LAW OF THE FAST is a source of spiritual strength – Read ISAIAH CHAPTER 58 again to be reminded of some of the sweetest blessings in all of scripture! FEAST on the scriptures, and you’ll have PLENTY of things to think and ponder about. 4 – FOLLOW THE PROPHET – Most if not all of us had the opportunity (the blessing) to raise our hands to sustain President Thomas S. Monson as not just the PRESIDENT of the Church, but the current LIVING PROPHET. And we sustained him and 14 others as “Prophets, Seers, and Revelators.” What does it mean to SUSTAIN them? ELDER DAVID B. HAIGHT: When we sustain the President of the Church by our uplifted hand, it not only signifies that we acknowledge before God that he is the rightful possessor of all the priesthood keys; it also means that we covenant with God that we will abide by the direction and the counsel that come through His prophet. It is a solemn covenant. (Conference Report, Oct. 1994, 17; Ensign, Nov. 1994, 14–15). If you want an incredible resource for things to PONDER . . . go to the talks from these 15 and other speakers at the recent General Conference. This is an opportunity for great spiritual refreshment and renewal. PRESIDENT MARION G. ROMNEY: (After a General Conference) We have heard enough truth and direction in this conference to bring us into the presence of God if we would follow it. We have been taken on to the spiritual mountain and shown visions of great glory. (Conference Report, Apr. 1954, 132–33). 5- EXPRESS GRATITUDE OFTEN! – Being thankful (and expressing thanks) is a healthy thing to do. PSALM 92:1 – It is a good thing to give thanks unto the Lord. 6- COME TO THE TEMPLE! – This can be like jumping in a reservoir full of water… except that it’s a reservoir of SPIRITUALITY. Even if we can just be on the GROUNDS of a Temple, or sit in the foyer for a little while – get your soul “FILLED” as often as possible! The temple provides a unique setting for understanding spiritual things. PRESIDENT SPENCER W. KIMBALL: One can learn to be loving. If one patterns his life in the mold of love – if he consciously and determinedly directs his thoughts, controls his acts, and tries to feel and constantly express his love – he becomes a person of love, for “As he thinketh in his heart, so is he.” (Proverbs 23:7) (Teachings of Spencer W. Kimball, p. 245, 251). Don’t you love experiences like when someone asks how you are and then waits to hear your answer?? There is a need for us to be filled with the Spirit – with oil for our lamps – and to cherish the gift of the Holy Ghost so that our lights may shine for others and we can help in the hastening of the work of bringing Heavenly Father’s children back to Him. l A CHURCH LEADER told a group I was in of visiting less active members with another stake leader following a training meeting on working with Church members who were less active. One woman was a “porcupine.” When she saw them on the doorstep she almost screamed at them. “I know why you’re here!” He responded with “Why ARE we here?” She said “You’re trying to get me to come back to church.” He said that had never entered his mind. So she asked “Well then, why ARE you here?” He responded with “May we come in and tell you why we’re here?” — and he did this with such love and gentleness that she let him in. (Maybe she was curious!). They sat down in the living room, and with genuine love he said “This evening the two of us knelt in prayer, asking Heavenly Father who needed us to visit. Your name came to mind. Can you think of any reason He’d want us to come and see you?” She burst into tears and said “Yes … because I’m miserable! And I’ve been miserable for years!” And she poured out her story and her heart to them. She was experiencing SPIRITUAL DROUGHT and MANY DOUBTS…. What followed was a tender time of comfort and healing. As they got ready to leave, he asked “May we offer a prayer for you before we go?” She quickly said yes and told them she couldn’t even remember the last time a prayer had been offered in her home. As the two brothers left, she was in tears, thanking them for their visit. THE LOSS OF SPIRITUALITY IS IMMEDIATELY NOTICEABLE . . . And SPIRITUAL DEATH is the most TERRIBLE of ALL DEATHS . . . .
DOCTRINE AND COVENANTS 11:12-14 (p. 22) And now, verily, verily, I say unto thee, put your trust in that Spirit which leadeth to do good — yea, to do justly, to walk humbly, to judge righteously; and this is my Spirit. Verily, verily, I say unto you, I will impart unto you of my Spirit, which shall enlighten your mind, which shall fill your soul with joy; And then shall ye know, or by this shall you know, all things whatsoever you desire of me, which are pertaining unto things of righteousness, in faith believing in me that you shall receive. Let the Holy Spirit guide; Let him teach you what is true. He will testify of Christ, Light your mind with heaven’s view. Let the Holy Spirit guard; Let his whisper govern choice. He will lead you safely home If you listen to his voice. Let the Spirit heal your heart Thru his quiet, gentle pow’r. 56- And at that day, when I shall come in my glory, shall the parable be fulfilled which I spake concerning the ten virgins. 57- For they that are wise and have received the truth, and have taken the Holy Spirit for their guide, and have not been deceived – verily I say unto you, they shall not be hewn down and cast into the fire, but shall abide the day. 58- And the earth shall be given unto them for an inheritance; and they shall multiply and wax strong, and their children shall grow up without sin unto salvation. 59- For the Lord shall be in their midst, and his glory shall be upon them, and he will be their king and their lawgiver.